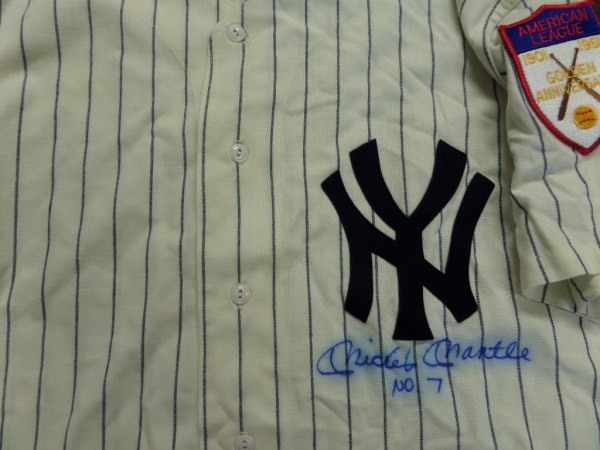 Coach's Corner - Mickey Mantle hand signed/inscribed New York Yankees M&N jersey! Go Back to Lot List Mickey Mantle hand signed/inscribed New York Yankees M&N jersey! This home white size XL 1951 New York Yankees throwback from Mitchell & Ness is in NM condition, and comes with everything sewn, including The Mick's 7 on the back, and an American League Golden Anniversary patch on the left shoulder. It is front-signed in blue sharpie by the all time great himself, grading a slightly-bled legible 7, with No. 7 added in his hand, and this baby will frame and show off proudly in any collection. Valued into the low thousands!